SHIP | What Does SHIP Mean? 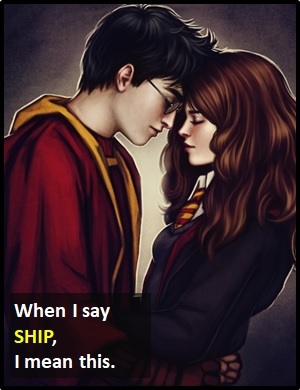 The term SHIP is popular in fanfiction cirles and refers to a (usually romantic) "Relationship" between characters in a book, film, TV series, manga, or anime. In this context, SHIP is a noun. However, SHIP is also often used as a verb, when it means to endorse a "Relationship". Usually, the SHIP in question is not canon in the original story, but is promoted or endorsed by fans. Such SHIPs include those between Mulder and Scully in the X-Files TV series, and between Harry and Hermione in The Harry Potter stories. Hermione and Harry were never a couple. Person A: I think I'm starting to like Brad. Person B: I totally SHIP you both! Person A: I always SHIPPED Dumbledore and McGonagall. Person B: Don't be silly! J K Rowling said Dumbledore was gay. Using letters from the start of the word (e.g., AMP from amplifier). Using letters from the start and end of the word (e.g., Dr from Doctor). Using an apostrophe to replace a letter or letters (e.g., can't from cannot). For reasons of brevity, contractions are rarely followed by periods/full stops and apostrophes are routinely omitted in text speak and on social-media platforms.